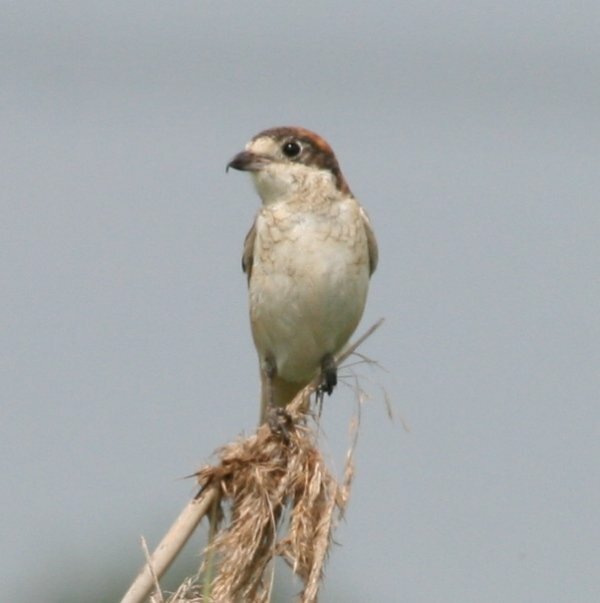 The Woodchat Shrike Lanius senator can be found all around the Mediterranean, including many parts of North Africa, and its range extends East into Iran. Within this range it is not hard to find and enjoy, with the latter aspect based on its fine colouration. It also used to be a rather common bird in the South of Germany, but the German population has crashed and collapsed (almost?) completely during the last 50 or so years, from 500 pairs in the 1950’s to around 30 pairs in the late 1990’s. If it still breeds in Germany at all, which it might do, it is so rare by now that pairs do not get reported to anywhere except to the relevant nature conservation authorities. 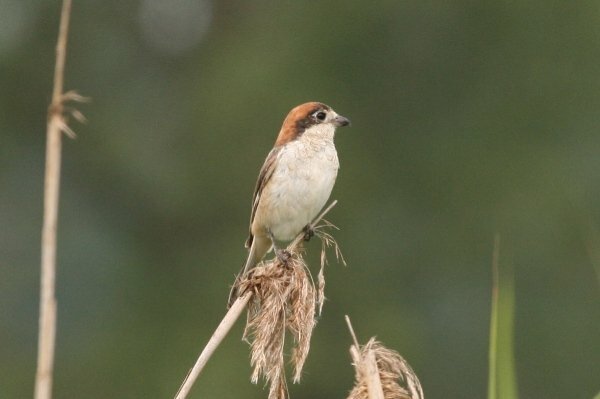 Those Woodchat Shrikes that do turn up in Germany each year, and there might be a handful of records, must therefore now be regarded as very rare “migration overshoots” or – as tragic as it may sound for a (former) breeder to the country – as true vagrants. I thus noted with much delight last week on the fabulous site ornitho.de (the German equivalent to eBird) that a female Woodchat Shrike had been found roughly 100 miles east of Heidelberg, and that she had been hanging around in the same area for a few days already. More importantly, I had a business trip to Bavaria scheduled for Saturday (yesterday) which would lead me to within 3 miles of the shrike, so a plan to go and see it was impossible to avoid. Which roughly translates to “Stationary in the area of the cattle pasture and the surrounding bushes and adjacent reed bed”. This was going to be easy. Cattle is mostly kept in housings in Germany (sadly), and cattle out on a pasture is a rare sight in our landscape. Therefore, all I had to do was find the – presumably only – cattle pasture in the grid cell, make sure it had a reed bed nearby, check the bushes and get my shrike. I found the grid cell – no problem. I found the only cattle pasture in the area – no problem. It had bushes and a reed bed nearby – no problem. 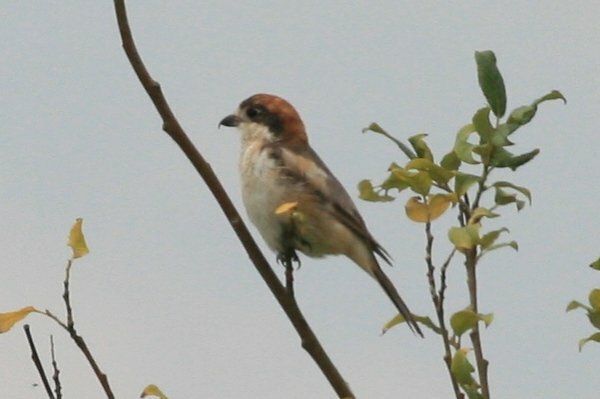 But even after one hour, I did not find the shrike – problem. Returning to my map, I noticed that the cattle pasture I had been searching was actually 300 m outside the marked grid cell of the shrike. What on earth? Could it be the shrike was somewhere entirely different? Possibly on a pasture where the farmer had taken the cattle off just prior to my visit? Well, the only way to find out – and more importantly: find the shrike – was to take the map, look at the exact border of the grid cell, and search the landscape within systematically, regardless of other birders’ comments. I started my systematic search for the shrike in the far north-eastern corner of the grid cell along a farming road through an extensive grassland, dotted with groups of willows and reedy drainage ditches. It did look good, except for the fact that there was no cattle to be seen anywhere. 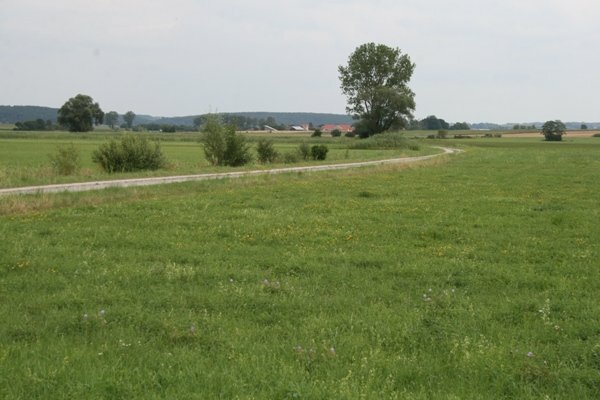 The meadows were as nice and birdy as meadows can get in western Bavaria at the beginning of August, with a flock of Common Buzzards and a few Red Kites soaring above, Whinchats everywhere, a singing Skylark, and even a few Meadow Pipits, likely early migrants. 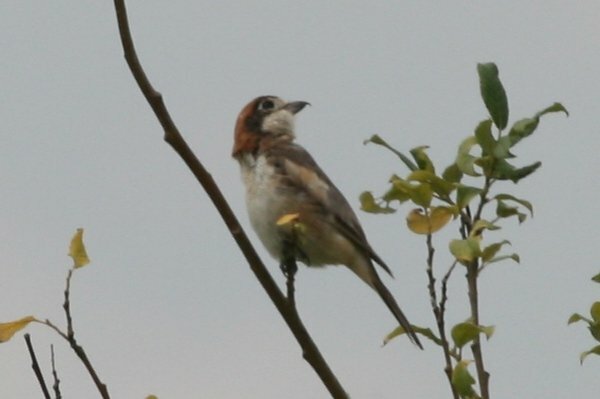 But you see – none of them were a female Woodchat Shrike. Even in small flocks of seven, White Storks do not resemble a female Woodchat Shrike. Ahead, top of bush, centre right: Shriiiiiiiiiiiike !!!! … female Red-backed Shrike. Dammit. That was it. 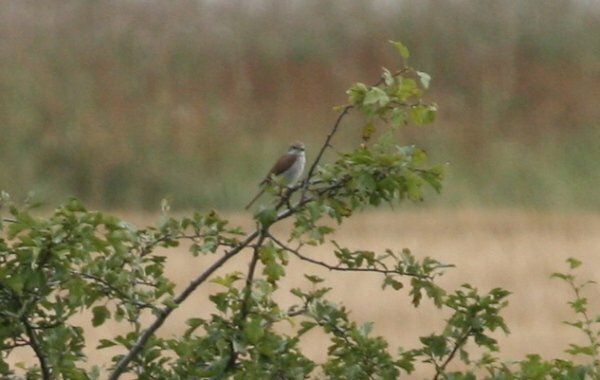 You may not be aware of this, but with a German breeding population likely exceeding 100,000 pairs, even a female Red-backed Shrike does not resemble a female Woodchat Shrike. And just when I was about 20 yards away from the willow, something hit me very hard on the forehead! See that last line? The German word “Weide” has a double meaning: pasture or willow! “Stationär im Bereich der Weide und der angrenzenden Sträucher und dem Schilfgebiet” therefore roughly translates to “Stationary in the area of the willow – not cattle pasture – and the surrounding bushes and adjacent reed bed”. And there I was, a mere 20 yards in front of a willow with surrounding bushes and a reed bed nearby. As soon as I saw the title of this post I thought “Oh, that will be Jochen”-the Wallcreeper springs to mind! This account is awesome, Jochen. We’ve all been through this experience, but not always with as happy an ending. @Clare: oh yes, that wallcreeper. I’m trying to see one this year as well, an especially meaningful bird to see during a year list competition. Oh, but be careful regarding the double meanings and language difficulties between English and Australian: if you write after your excursions along the beach and your wader counts that a certain rarity is “on sandbar in front of beach”, the Aussies will go look at the rarity while the British will circle the beach bar, wondering where the bird went. @Mike: Thanks! And tell me about the not so happy endings: Due to this year’s competition and the advent of ornitho.de, I’ve been a terrible twitcher, with “terrible” referring to my abysmal success rate rather than my ambition. I’ve dipped on some very fine bird species this year, e.g. White-headed Duck twice, Broadbilled Sandpiper twice, Yellow-billed Loon twice, Short-toed Snake Eagle, Cattle Egret, Lesser White-fronted Goose, Saker, Short-eared Owl, Red-rumped Swallow. Geez, now that I’ve written them all down, I realize just how tough a year I am having in Germany. Don’t let the numbers fool you – it is going to be a struggle beating Corey!! And that last line … you only say that so I help you find birds around Berlin. @Clare: if you are the only one wearing a bikini on a beach, what are the others wearing? Geez, more reasons than just waders to visit the beaches of Broome? 🙂 And there may be more birders in Britain than in Australia, but how many of those would prefer a cold brew in a beach bar over a rarity on a sandbar? And thanks for wishing me luck with the ‘creeper. As you can see, I really can use some luck. @Clare: ah yes, the average age of nudists – you forgot to mention that most are male. 🙂 And mango season, hmmmmmm. Mangos & birds & birds & bikinis. Broome’s quite the site, ey?